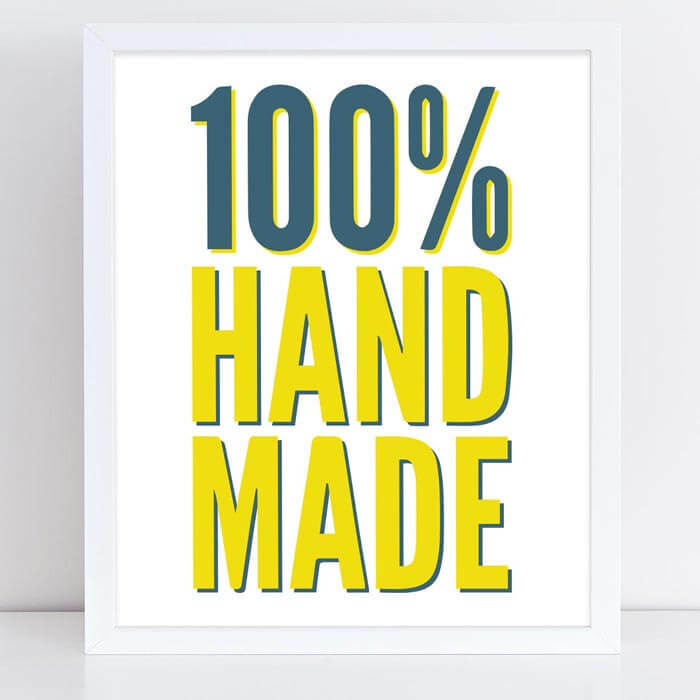 Printable sign for your craft booth. 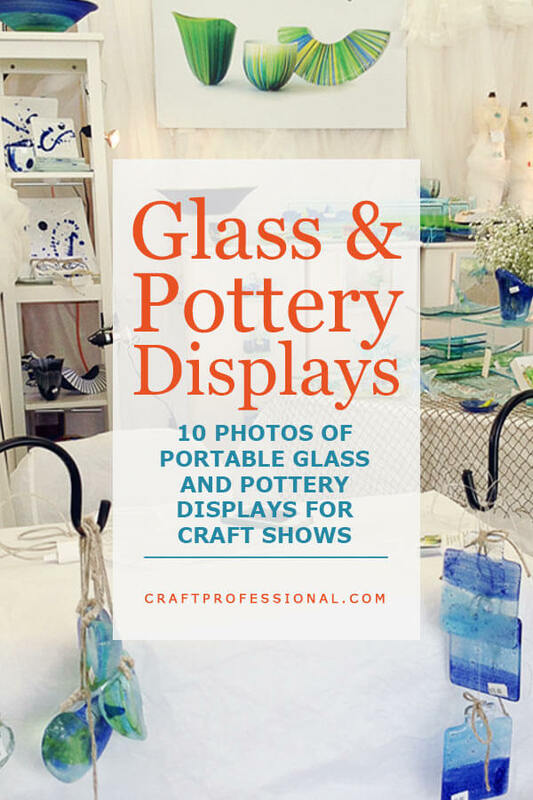 Pottery and glass displays for craft shows have their own set of considerations to take into account. Specifically, the product on display is extremely fragile, so the portable displays need to be truly sturdy. Also, great lighting - important in all craft displays - is doubly important here, particularly when showing glassware. 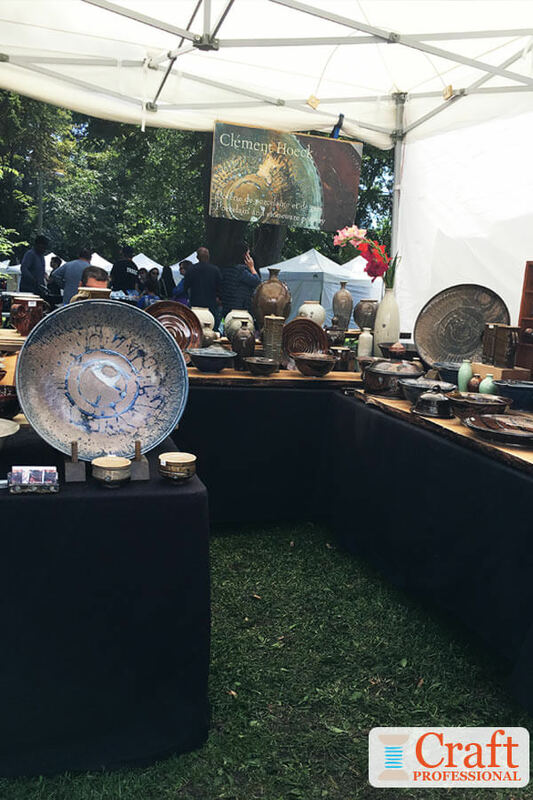 Here are 10 photos of craft booths that show portable glassware and pottery displays you can emulate when creating your own craft show booth. 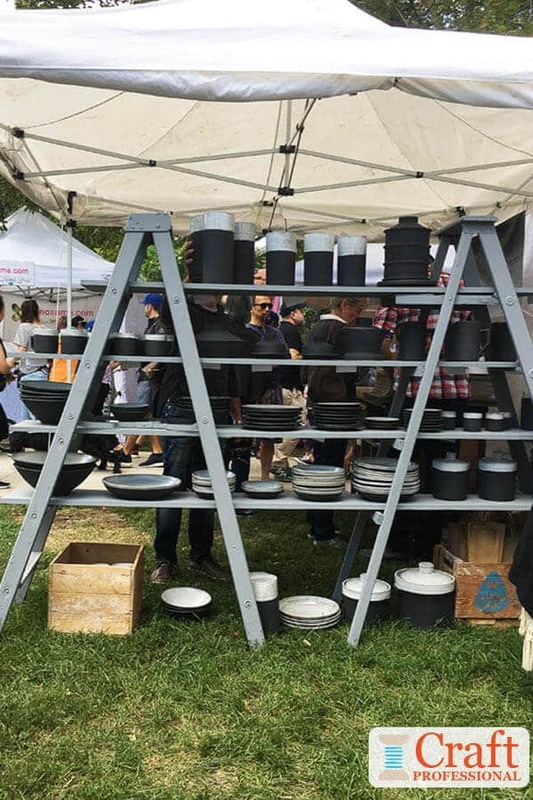 I've shown this tableware display before, but it's just so gorgeous in its simplicity, I love to share it whenever I have a new photo of this booth. The color works beautifully. 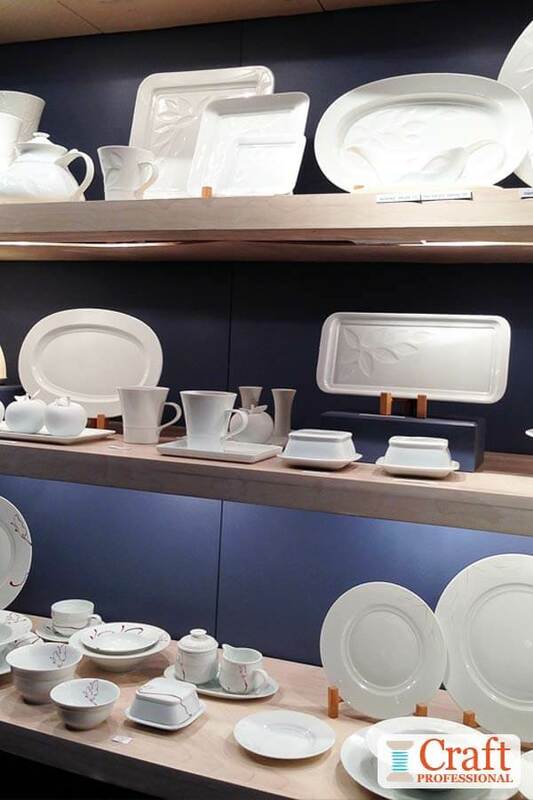 The midnight blue backdrop is a rich, gorgeous alternative to black that works perfectly with the white tableware and the light wood colored shelves. Using multiple straight rows of shelves like these in a display can pose a problem. If you're not careful, you can end up with rows and rows of straight, unbroken lines that become monotonous and don't move the eye around the booth. 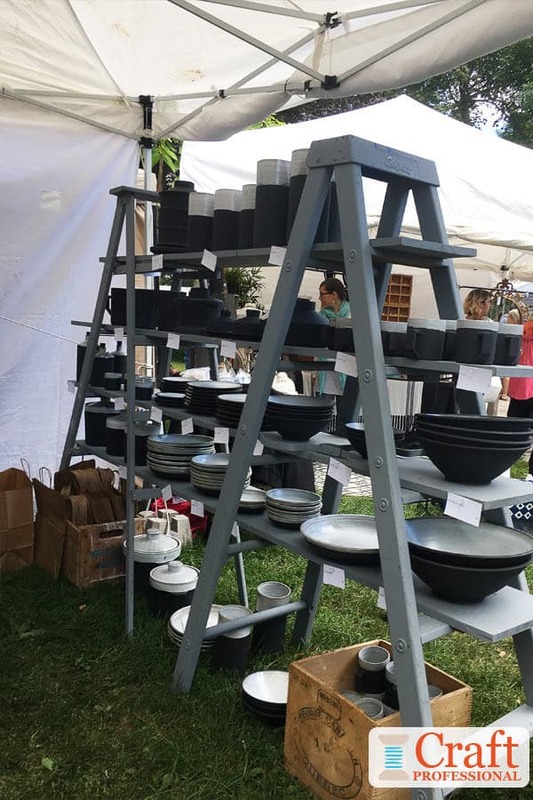 In this display, the lines are broken up with a variety of height created with plate stands and clever groupings of different sized objects. The other hazard of rows of shelves is it can become dark under each shelf if you're not careful. Notice all of the lighting installed under each shelf to ensure everything is well lit. Next, we have four photos that show pottery and glass displays using ladders. There are two booths shown from different angles. One at a huge indoor show, and the other at a smaller, but fantastic and more casual outdoor show. Two ladders, a few boards cut to the the right length and width, plus some paint to tie it all together are all you need to create sturdy, affordable, portable display shelves. 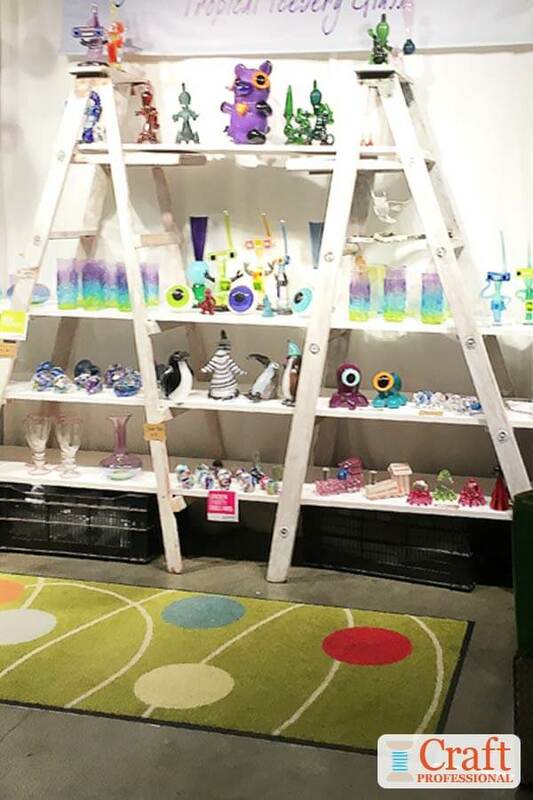 With ladders, you're setting up rows and rows of shelves, so do be aware of creating movement with different heights and different focal points throughout the display. The photo on the left shows a well lit ladder at an indoor booth with access to power. 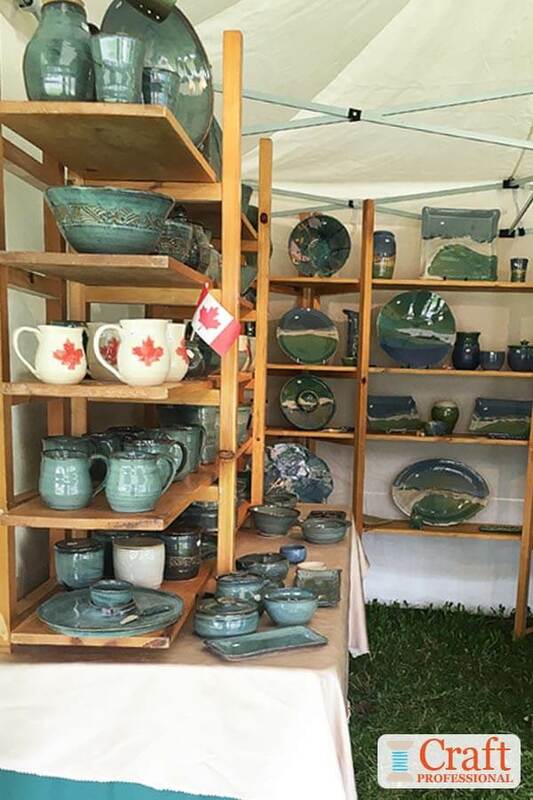 The other photos show a display with no lights because vendors do not have access to power at this outdoor show. If you did want under-shelf lighting at shows where you don't have access to power, consider battery powered lights, plus rechargeable batteries to keep battery costs manageable. Here's another glass display I've shown before, but I have to share this new photo because it's so gorgeous. The display furniture is all white, creating a perfect neutral backdrop for the glassware to shine. 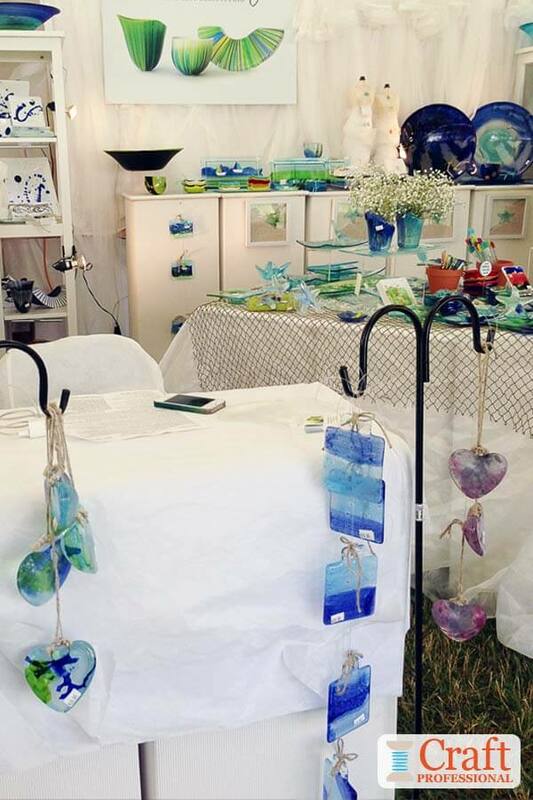 The blues and greens in the product suggest a nautical feel, and that is subtlely reflected in the display with the netting that looks like a fisherman's net covering the table on the right side of the photo. If you look closely, you'll notice spot lighting throughout the booth. The large product poster on the back wall creates a focal point that quickly communicates this glass artist's style and draws people in from a distance. Next, we have two sides of the same booth. On the left, portable shelves sit atop a counter-height table. On the right, there's a similar table, but this time sturdy wood crates are used for display. These crates would beautifully do double-duty for storage and transportation to make booth set up and tear down so much easier. 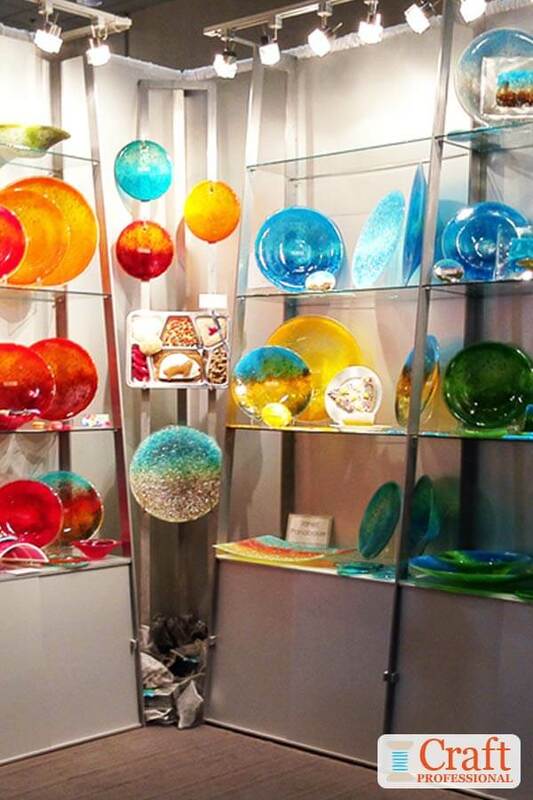 This glass display is all about the lighting. Once more, we have rows of shelves, but this time the shelves are glass, so all of the great lighting at the top of the booth can flow through from the top to the bottom shelf. Granted, glass shelving is breakable, and, therefore, tougher to work with. This display is at a large, multi-day, indoor show where the booths are more substantial than you'd see at a single day show. It's not the right choice for every situation, but, at the right show, it works beautifully. Here's a clever idea for tabletop displays that I don't believe I've seen before. Look very closely at the top of the tables on the right of the photo and at the back. 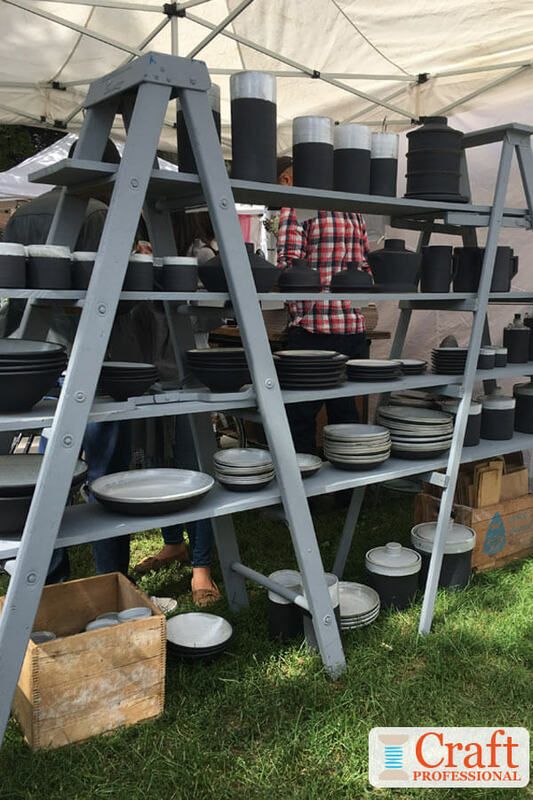 The tables are covered in black fabric to create a sleek look, but live edge wooden planks have be set on top of the tables for the pottery to sit on. It's subtle. 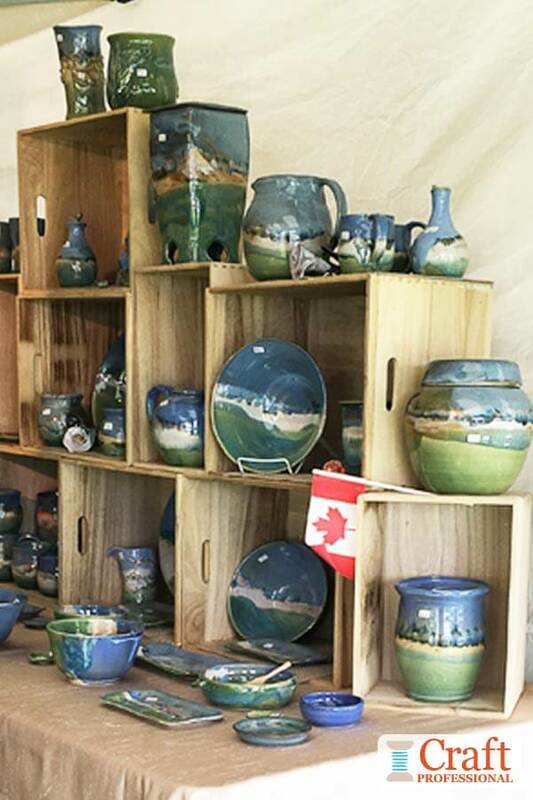 You might not notice it unless you were really examining the booth, but the light wood creates a richer look and adds contrast to the pottery. Imagine if the wood wasn't there, and the mostly dark pottery was sitting directly on the black table coverings. There'd be very little contrast between the table and the pottery, so the product wouldn't stand out as well. This display is at a casual, outdoor show where exhibitors don't have access to lighting, so the light colored wood table top also serves to lighten up an otherwise dark display. 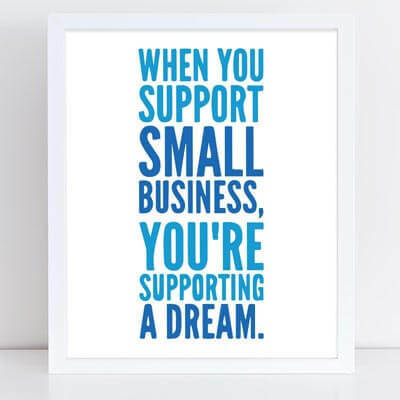 Encourage shoppers at craft shows to splurge a little, or support small business with the printable signs for your craft booth available in my Etsy shop. 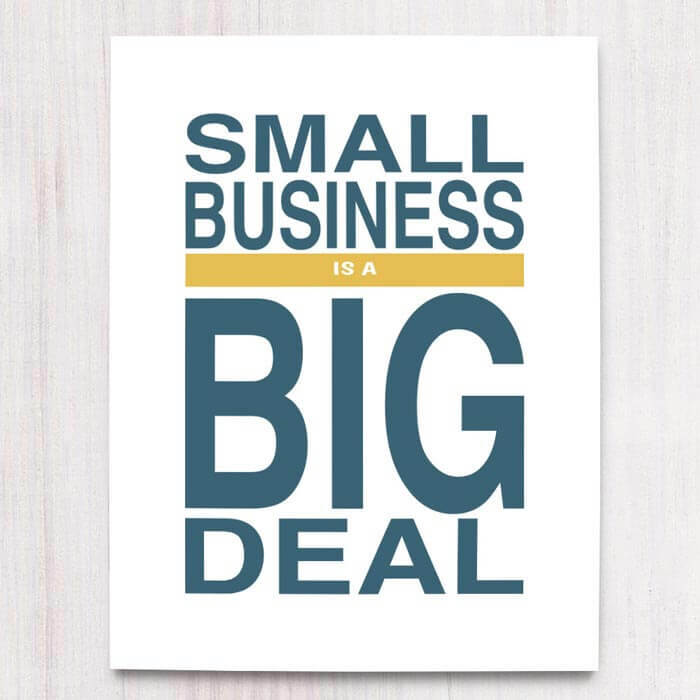 Printable signs for your craft booth. 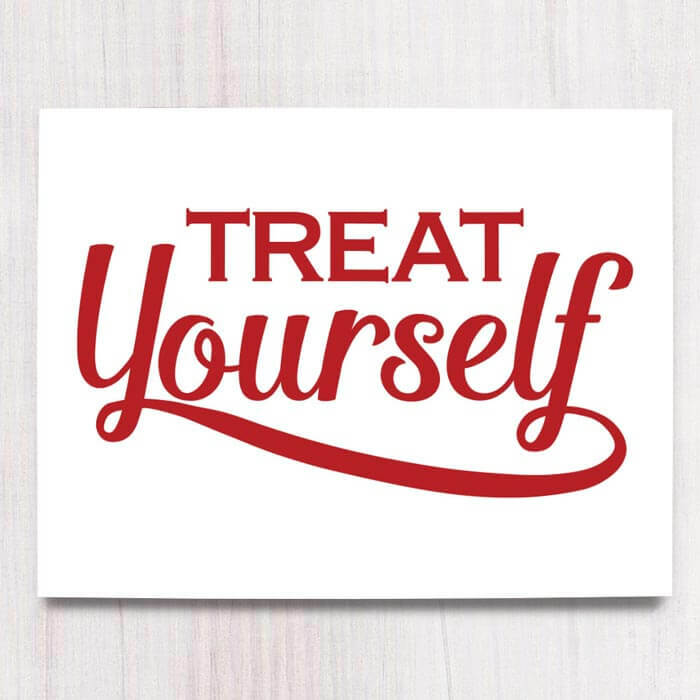 Encourage customers to splurge a bit on a treat from your craft booth.